I was born and raised in the streets of Metro Manila for as long as I can remember and in those years I was blessed with family who worked hard and made a life for themselves but never forgot their roots, especially the family recipes of Filipino cuisine passed on from every generation. You could say that I was raised up to this point with Filipino food which to my taste is best filipino cuisine I've had and will ever have. Nothing beats home cooking. So you could see my reluctance to ever be excited at eating at any Filipino restaurant. Revolutionary Cuisine is a play on two (2) meanings! 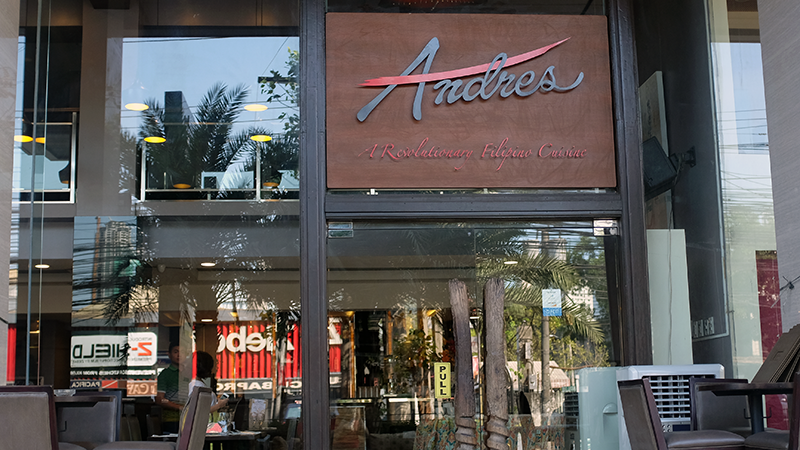 Among the busy street of Chino Roces Avenue is a hidden restaurant called Andres, a revolutionary Filipino Cuisine. The Revolutionary Cuisine is play on two (2) meanings. The first is they aim to revolutionise or give a twist to the classic Filipino dishes and the second is a play on the Philippine revolution. 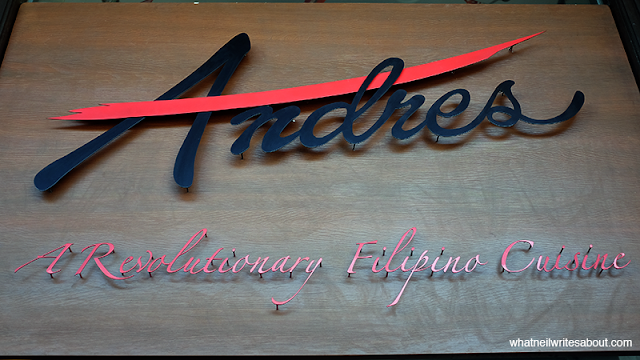 From Andres itself, it is a homage to Andres Bonifacio. In fact if you read their extensive Menu, it is Katipunan inspired. Feel free to eat it patriotic pride. 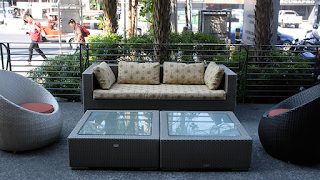 Free from the Bamboo and wooden upholstery design Language! Chino Roces Avenue (Formerly Pasong Tamo) is a long road with several establishment and the nearest landmarks for the restaurant are Don Bosco Makati and Mitsubishi Pasong Tamo Dealership which are right across Andres. The facade of the restaurant is covered by tall palm trees so it is easy to miss which is a sad thing. On the outside it would seem to be one of those high ceiling with huge glass windows type of establishments. There are numerable tables on the outside, the ground floor and the second floor. 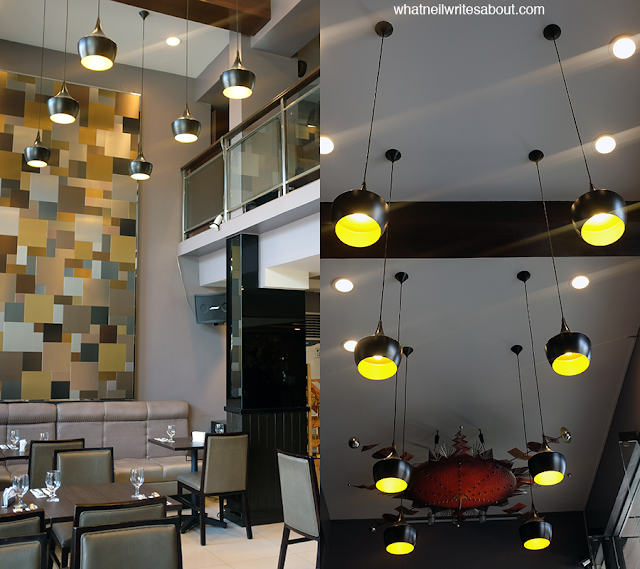 Interiors carry Filipino Modern Aesthetics! When I first heard of this place, I was plagued by thoughts of Filipino restaurant stereotypes. You know, like buffet lunch with the usual kare-kare with krispy pata, the not so bright lighting and ambiance, and the interior design inspired by bamboo and wooden upholstery. Not that those are awful, it is just there are a lot of those restaurants. 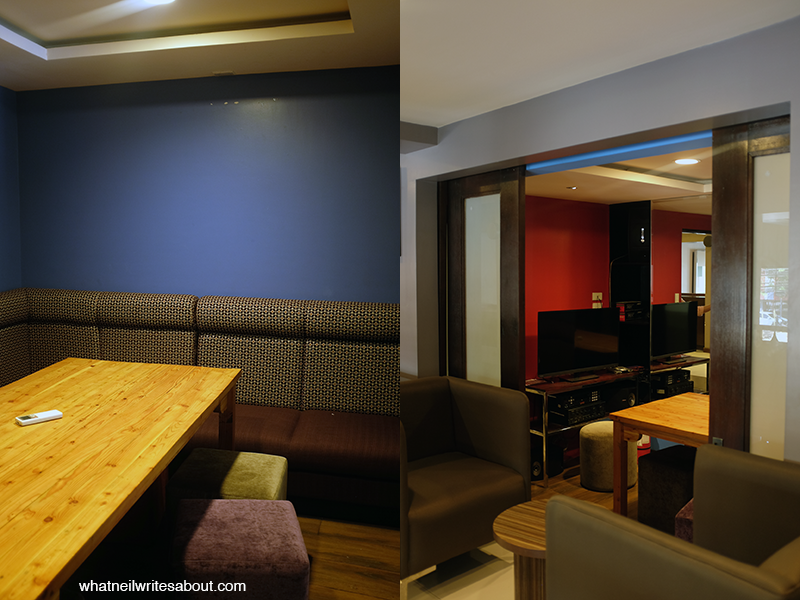 I am happy to tell you that Andres' interiors carry Filipino Modern Aesthetics. One of my favorites is the Sun and Star shaped Lighting fixture sitting above you yet it easily catches your eye as you first wonder in. At the edge of the bar is a stairwell that leads to the second floor where along the way they feature several Paintings from an Artist of the month. Once you reach the end of the hall way you will find two VIP Rooms that can hold eight (8) to twelve (12) people. The Price for the VIP is consumable so eat and drink to your hearts content. As mentioned earlier, they are inspired by the Philippine revolution specifically, the Katipunan and they strive to revolutionize classic dishes by adding different twists to them. For example, the classic tinola is known to have clear flavorful broth that warms your tummy. Their take on it is that they made the soup thick and and creamy which may sound weird but It works really well! 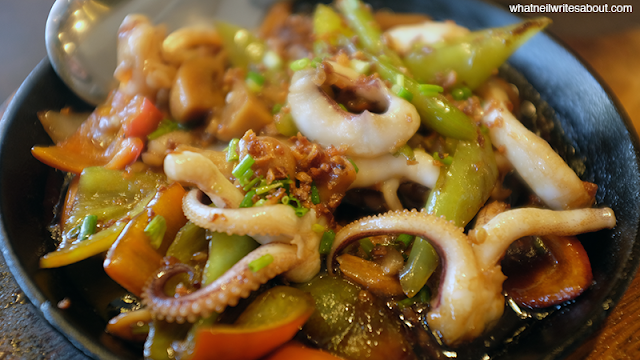 In fact it is one of their most sought for dish which they call the Tinolang Katipunero. As you read through their menu, it becomes apparent that their creativity is something to take note. 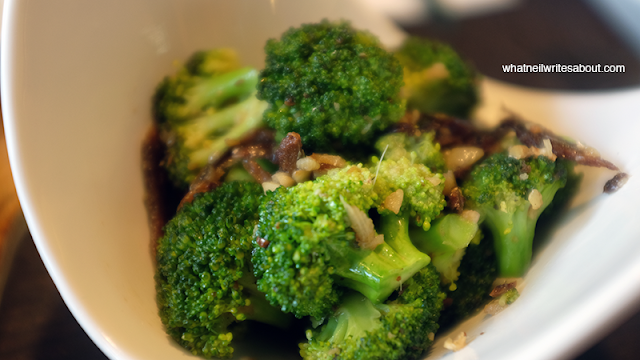 You will find dishes like the Broccoli Y Tuyo and the Tapa Y Pasta. All of their dishes have different takes and sometimes the combinations sound counter intuitive but I encourage you to try them. It usually is the unique dishes that are the best and are the most gratifying. The Balut Ala Procopio arrived first. We couldn't not notice because as soon as the sauce hit the sizzling plate, the aroma just reached our noises. I took an egg and sliced it with my knife and stabbed it with my fork. I then took a bite and my gosh. 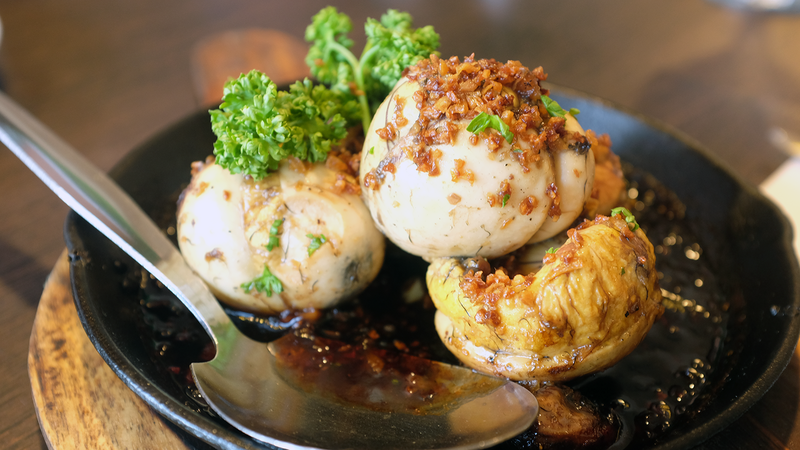 The well seasoned garlic brought out the flavors of the oyster sauce which was apparent all the way deep inside the egg yolk and the chick itself. I was blown away. Kalderatang Kambing Topped with Cheese and peppered vegtables! Their take on the Kalderetang Kambing is an interesting one. 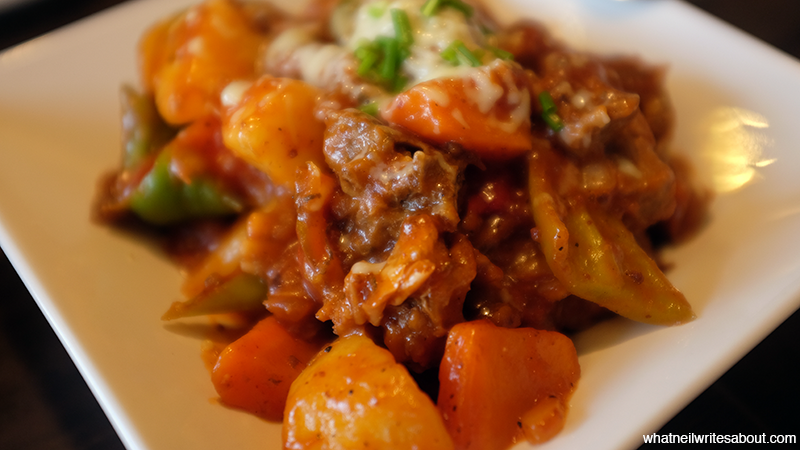 At first glance you see the normal brown and oranges of the classic Kaldereta but with more vegetables like bell pepper, carrots and potatoes and it is topped with cheese! As you take that first bite, you feel each strand explode with flavor from the marinade individually and all come together like fireworks where smaller fire cracker pellets explode together to form an even bigger explosion of flavour that leaves your mouth in awe. The saltiness of the cheese and the sweetness of the carrots and potatoes then follow to balance the spiciness of the Kaldereta. It was like a school dance of flavors in your mouth. The only gripe I had with the Kaldereta is the sweetness tends to aggregate over time and gives you that 'nakakasuya' feeling. If you will have it for a few bites it isn't apparent but If you are eating with friends and plan to stay and talk for a while with bursts of digestion then the sweetness may take its toll. 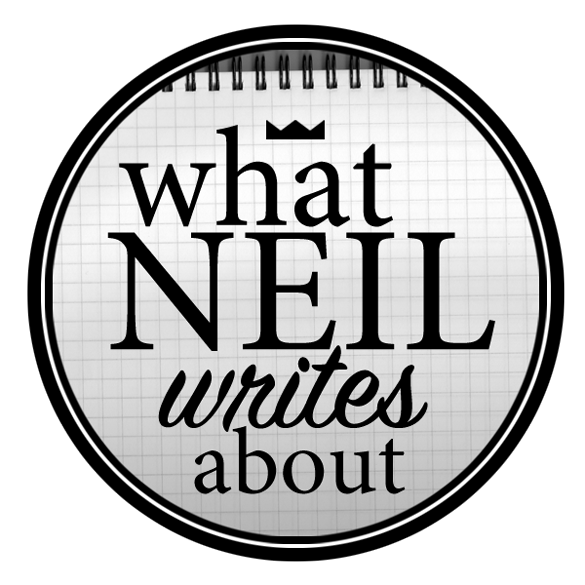 It becomes apparent that their creativity is something to take note. The Broccoli Y Tuyo was quite a pleasant surprise because I never thought that the saltiness of the 'Tuyo' would be a nice mix to the broccoli flower. What I usually hate when I eat vegetables is when it isn't fresh and it isn't prepared properly. On dishes like the Broccoli Y Tuyo and the Sizzling Calamarez, the vegetables did not taste like grass nor was it soggy. It was crunchy and well seasoned that the flavors were brought out wonderfully, distinctly when they touched my tongue. Crunchy and well seasoned that the flavors were brought out wonderfully! 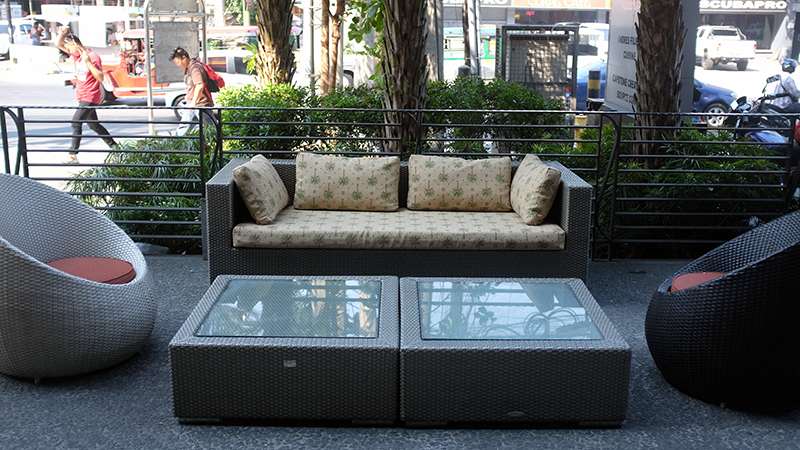 When I arrived I was greeted warmly, asked promptly if I had a reservation and if I would have company. Victor, our waiter lead us to our seats and gave us each a menu in one smooth motion. he must have had a lot of practice. I asked them of the details of Andres. What followed was me reaching for the menu and exchanged questions with Victor regarding the finer details of the different dishes. He was able to describe and recommend based on my personal specifications. It was a long exchange as it was my first time there. He recommended that we at least order an appetizer first so they can prepare it while we pick the main course and damn, can he sell it. Good Job for their team. 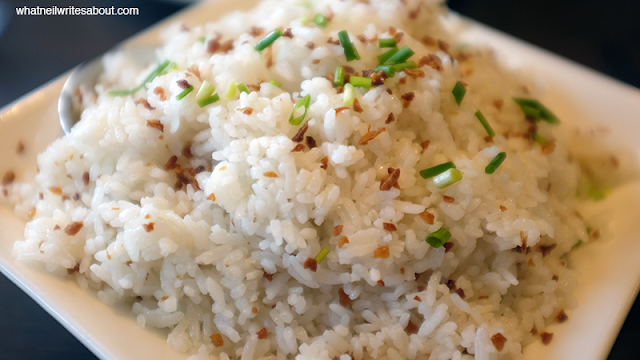 The price range of the dishes start at Php 180.00 and can get up to Php 550.00 depending on the ingredients used. 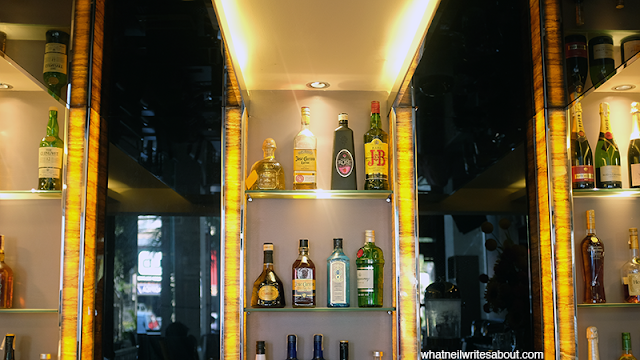 They have several Promotions like a Lunch Buffett for Php 250.00 per person and DRINK ALL YOU CAN for Php 250.00 from SMB products and select cocktails. They even have a Happy Hour promotion from 5PM to 10PM where you can buy six (6) bottles of San Miguel Beer Products and get a free side dish (Pulutan) from a list. If you love live music, they have Acoustic Nights happen every Wednesday, Thursday and Friday. The VIP Rooms have their own Karaoke system, and their own air conditioning units and they cost only Php 6000.00, consumable.